Public safety administrators, including police and fire chiefs, as well as EMS directors, bear no greater burden than the safety of their own. Yet year after year, more first responders are killed in vehicle accidents than by any other means. In the last ten years, 73 U.S. law enforcement officers were struck and killed by a vehicle in roadside incidents while outside of their cruisers.1 During that same period, 32 U.S. firefighters and emergency medical personnel were also struck and killed in roadside incidents.2 Sadly, these numbers don’t even reflect the hundreds more first responders who are involved in roadside accidents who survive, but are severely injured or incapacitated. These tragic and unfortunate accidents are often avoidable. Major campaigns such as “Below 100” and the “Move Over” highway safety laws, now enacted in 45 states, have slowed the fatality rates, but it is not enough. Traditional tools such as vests, flares, flashlights, and reflectors may have been an improvement in their time, but their effectiveness is now suspect. This begs the question: What effective alternatives do we have? Studies have revealed that high visibility personal protective equipment significantly improves the visibility of emergency responders working on the roadways and can be a major factor in first responder safety. First responders cannot be safe if they cannot be seen. This concept goes beyond traffic safety. We need to be able to easily find and identify our first responders in a crowd or when environmental conditions make it difficult to spot them. Today’s first responders need an effective choice to help keep them safe and let them focus on the other more inherent dangers of their work. They need a tool that transforms them into a visible beacon visible from great distances. To be effective, it must be lightweight, bright, rugged, long-lasting, and easily adaptable. It also needs to easily identify them as a first responder. But most importantly, it must help keep them safe. As public safety agencies sort through mountains of new modern technologies year after year, searching for the best options, we suggest an alternative. This paper gives an answer to the all-important question of what safety administrators can do to help their men and woman return safely home to their families at the end of each day. In November of 2016 Colorado State Patrol Trooper Cody James Donahue was investigating a minor traffic accident outside of his cruiser. Though wearing a reflective vest at the time, he was struck and killed by a commercial vehicle. Trooper Donahue left behind a wife and two young children. The safety of first responders is always a foremost concern. Of critical importance to first responder safety is visibility. Unfortunately, with hundreds of first responders still struck by vehicles and dozens perishing every year, we are still struggling to make real inroads in this important area. We owe it to our first responders to make sure they make it home at the end of each shift. However, the problem of limited visibility goes beyond roadside functions. Today’s emergency personnel don’t travel only by traditional means, with their bright strobes and take down lights. Today they get around on horseback, bicycles, ATVs, and more; all of which offer little in the way of illumination or emergency lighting to increase visibility. According to the Federal Bureau of Justice Statistics, 55% of all local police departments utilize foot patrol while 32% have bicycle patrol. And those percentages are as high as 100% in agencies that serve larger populations.3 Mounted police are also popular among larger agencies, with 77% of them regularly using mounted patrol. their uniform and limited lighting, such as a flashlight or simple beacon attached to their uniform. This is insufficient to either readily see or identify first responders who need proper visibility and lighting to warn drivers and establish safety zones. Throughout the country, there are tens of thousands of large events, crowded venues, celebrations, protests, and riots. First responders work nearly every one of them and need a way to signal where they are so that anyone can see. Whether doing a bar check, looking for a lost child deep in the woods, chasing someone on foot, getting mixed in with a protest, or working large venues, it’s difficult, if not impossible, for first responders to provide their location if they need assistance. Even if they know where they are, it is not always easy to articulate that on the radio. Crowds turn violent, people get lost, and police need a way to signal for backup. What’s almost equally important is for the public to be able to identify a first responder when they see one. While in their emergency vehicles with large lettering, and abundant strobe lights, there is no mistaking who the first responders are. But most emergency personnel perform their duties outside the vehicle. Whether doing area checks on foot, working a bicycle unit, mounted patrol, or any one of the ever-increasing modes of transportation for first responders, law enforcement personnel need to be recognized as such. First responders find this to be a challenging task outside of their vehicle. Safety has always been a priority in what is otherwise an inherently dangerous occupation. Lighting and visibility have always been crucial to emergency personnel and the ability to do their job. When it comes to equipment to help provide visibility to first responders, technology has been slow to effectively adapt. From uniforms, vehicle lighting, and portable radios, to flashlights, reflective vests, and inferior portable lighting systems, they all have tradeoffs, making them less than completely effective for the visibility, identification, and lighting of first responders. There are a few body-worn lighting systems out there, but they lack the features sufficient to improve the safety of first responders. The highest rated vest for first responders is designed to only be seen from 1,280 feet,4 a distance that a vehicle traveling 65mph can close in only 13 seconds. The effectiveness of a vest at this distance is dependent on multiple conditions; the first responder is already out in the open at that point; the vest becomes illuminated by lights at just the right angle and brightness; and the driver immediately sees the vest once it’s illuminated and can react quickly enough. A radio will not help pinpoint an officer in a crowded venue unless the officer can radio his exact location. Of course, that could change by the time assistance arrives. And in an emergency, it may even be difficult for a first responder to get time on the radio. Or worse yet, an officer may be down due to a medical condition, accident, or violent act. The public identifies with a first responder’s uniform as a symbol of trust, dedication, and service. However, it does little for visibility on the roadway or in a crowded venue. It may also be difficult to identify those not in standard uniforms such as bike officers or mounted patrol. Though lighting and battery capabilities have improved since it was invented, the functionality of the flashlight has remained relatively unchanged. The standard first responder flashlight still limits users to a single, unidirectional, white beam. It does not have the ability to identify emergency personnel through varying colors, and rarely is there a strobe capability. 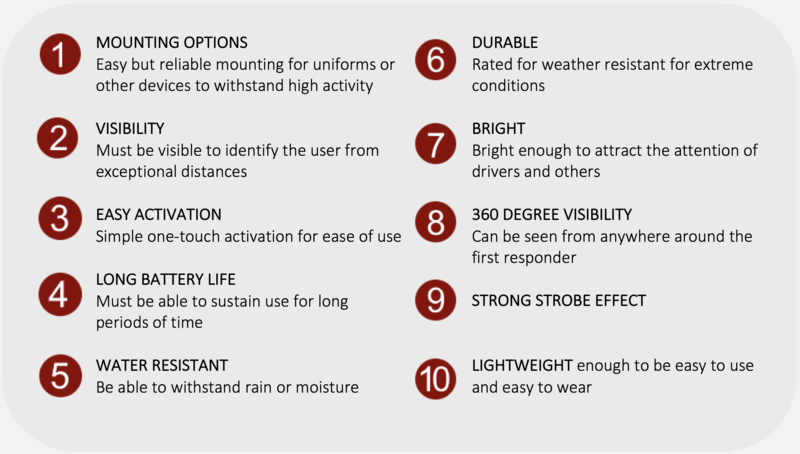 In the search for a tool that provides emergency personnel with life-saving visibility and first responder identifying capability, you need look no further than the Guardian Angel. 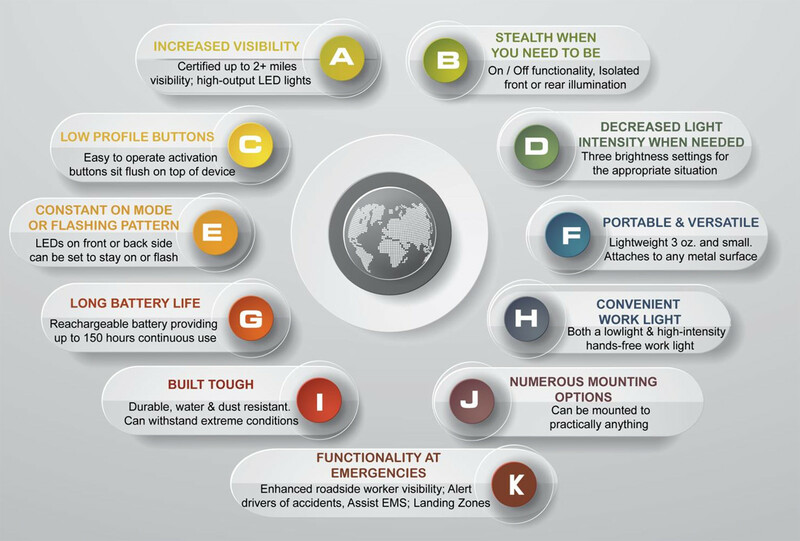 The Guardian Angel safety device is a wearable, portable light that provides superior visibility to law enforcement, safety, and civilian professionals. This advanced piece of engineering technology makes great strides in the advancement of portable lighting technology of first responders by displaying bright LED lighting capabilities at great distances and up to 360-degree visibility in strobe effects and varying colors. The Guardian Angel provides personal visibility and versatility in a durable lightweight device. It was designed by law enforcement officers and first responders to be as tough as the people who wear it. Additionally, the Guardian Angel can serve as a visual disruption tool, providing a tactical advantage to officers while dealing with contacts. The Guardian Angel comes standard with a neodymium magnet mount. A neodymium magnet is a permanent magnet made from an alloy of neodymium, iron, and boron to form the Nd2Fe14B tetragonal crystalline structure. This material is currently the strongest known type of permanent magnet. You can attach this mount underneath your clothing, or purchase the many available mounts for your shirt epaulet, bike mount, or windshield mount. The included magnet also works to attach to the hood of your vehicle for certain situations. EMS World knows that personal visibility is essential to EMS providers, whether it be at a roadside, a wooded area, or in a crowd. They tested the Guardian Angel and found that even during rigorous activity, the lightweight device was able to maintain its original position while attached to a standard EMS jacket. The Guardian Angel still functioned after a drop down a flight of 5 steps, a throw across concrete, and even after it was driven over by a 7-ton truck, suffering nothing more than some cosmetic damage. The International Police Mountain Bike Association conducted rigorous testing of the Guardian Angel. While mounted to the handlebars, they rode the bike down stairs, up curbs, and anywhere else that might have jarred the light loose. They also performed bike dismounts and hard landings, without any damage to or issues with the light. They were impressed with its rugged durability. Archangel Device is the creator of the Guardian Angel® product line. From our headquarters in Milwaukee to our distribution partners across the globe, we strive to provide our customers with superior service in every way possible. We are driven by a desire to keep people safe and we are committed to advancing technology to do so. Fueled by a core belief that advanced technology can enhance safety, our mission is to develop innovative, high-tech products that make the world a safer place. Backed by multiple patents, we develop innovative products that improve the overall safety of individuals and professionals in a variety of situations. Every officer should make it home at the end of the day. That’s why we created the Guardian Angel device. The men and women who use it feel safer and better equipped to do their jobs. Our technology is superior as such, that we have had massive growth since our launch. We have doubled sales each quarter in the past year and sold over 6,000 devices to departments domestically and internationally in the last quarter alone. Some of our more notable users of the Guardian Angel include Milwaukee County Sheriff’s Office, Fort Lauderdale Police Department, Dallas Independent School District, Waco Police Department, Santiago Chile Police Department, United States Secret Service, Longueuil Police Department in Quebec, Coast Guard of India, and many others. Bureau of Justice Statistics (2001) Community Policing in Local Police Departments. Retrieved from bjs.gov/content/pub/pdf/cplpd99.pdf. Britton, J., (2014 Jun 12) The Guardian Angel: The Police View. Retrieved from: ipmba.org/blog/comments/the-guardian-angel-the-police-view.